Thinking about playing online poker? Before you can put poker tournament strategy tips to the test, you need to know the basics of the game. If you’re new to the world of Internet poker, we’ve got good news and bad news. Online poker sites offer a variety of poker games to choose from, including Texas Hold’em, Omaha, Stud, Horse, and everything in between. If you want to play online poker and implement a newly learned poker strategy, you’ve got tons of variety. That’s great if you know all the games. But it’s not so great if you’re just starting out and have no idea where to begin. That’s why we’re here. Today, we’re going to walk you through the most popular online poker variation. Texas Hold’em has taken the world by storm, arguably becoming the most popular version of online poker. If you look back a few decades ago, 5-Card or 7-Card Stud was the game people played at home poker games. But the Internet has fueled the appetite for Texas Hold’em. It’s the go-to game people play online. And it’s the most popular game at the big live poker tournaments. In fact, the World Series of Poker Main Event uses the Texas Hold’em format, and many poker cash strategy sites focus on this variation of the game. 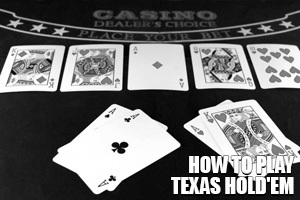 Texas Hold’em is a poker game with shared cards. Each player has two cards to work with and there are five community cards on the board that all players share. Your goal is to make the best 5-card hand using any of the seven cards. The type of poker tournament strategy you’d use depends on which position you’re in, but we’re just covering the basics today, so don’t worry about any of that. One player starts off with the dealer button. In a live game, this is usually determined by a round of dealing. The player with the highest card is the dealer. The same happens in online poker tournaments and in initial cash games assuming a game isn’t already in play. The player to the left of the dealer button is the small blind. The player to the left of the small blind is the big blind. Both players post their blinds. The big blind is usually twice the size of the small blind. These values increase as a tournament progresses but remain stagnant in cash games. At this point, each player is dealt two cards starting with the small blind. No community cards are dealt. After each player receives their two cards, a round of betting occurs, starting with the player to the left of the big blind. Players can fold, call, or raise. The amount they can raise for each round of betting depends on whether you’re playing Limit or No Limit Texas Hold’em (and the poker tournament strategy you’d use for betting also varies). After all bets are in, the dealer burns one card (that means one card is dealt face down). Then three cards are dealt face up. This is called the Flop. Another round of betting occurs, starting with the small blind. After all bets are in, one more card is burned and then one card is dealt face up. This is called the Turn. After another round of betting, another card is burned and a final card is dealt face up. This is called the river. Finally, one more round of betting occurs. Remember, there are slight variations to the rules depending on whether you’re playing No Limit or Limit Hold’em, but the basics outlined here apply.